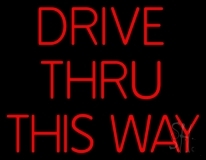 Put your restaurant business into spotlight with addition of drive thru neon sign. 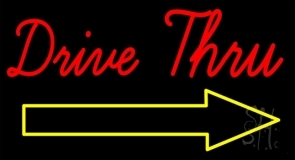 Neon drive thru sign displayed at your restaurant will make those passers to flock by your restaurant to have their fix. The striking glow of drive thru neon light makes it easy for the motorists and passers by to spot your restaurant even from several blocks away. 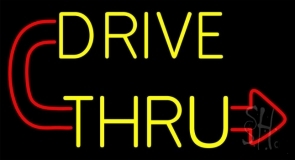 If you have a drive thru arrangement at any of your stores or any roadside restaurant, then drive thru neon sign is sure to bring in crowds of customers. Drive thru neon lights can be kept on all night and day for many years creating a burning mark on the minds of your customers. We have a unique collection of neon drive thru restaurant signs designed by our designers. 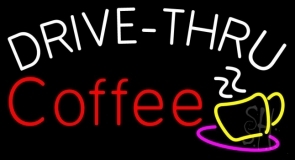 Select a drive thru neon sign from our collection such as a hot coffee cup designed with drive thru and an arrow, a neon chef pointing out the direction to the drive thru and many more. 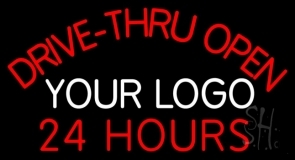 If you have a 24 hour drive thru service, then select our 24 Hours Drive Thru Neon Sign and make your store, a stand out from others. 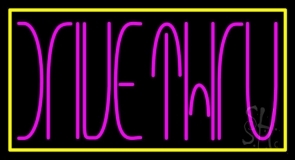 Hundreds of options of custom neon drive thru lights are available at Everything Neon, if you wish to look for something unique. We also custom make drive thru neon signs that are designed keeping your requirements into record. Submit your business name and logo and our well profiled designers will create a distinct drive thru neon sign that will best suit your restaurant. 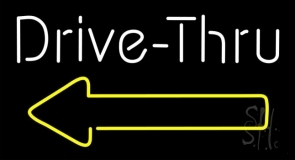 Click here for design and custom drive thru neon sign today!